In 1683, the tower of St Swithun’s church was struck by lightning and set on fire. Bells melted because the fire was so fierce, but the body of the church was saved from injury. The rebuilding was apparently badly done, leading to the collapse of the tower 102 years later. This is an account of the fall of the Tower of St Swithun’s church, in 1785. The tower had been rebuilt in 1684, after having been burnt by lightning, September 6th 1683. A large crack had shown itself some time previously at the foundation of the north-west angle, which passed through the stone staircase contained in that aisle; a large part of the foundation had at different times fallen down, which revealed the badness of the materials, being a casing of indifferent stone, and the interior filled up with rubbish. The bells were 6 and very heavy. They had not been rung for some time as they shook the tower very much. On Saturday, November 12th, a quantity of stone had fallen from the north-west angle; soon after, stones were found at some distance from the foundation, through the pressure, as if thrown from an engine. Then the great crack spread fast up the tower, which soon showed other great cracks. Stones were then heard to fall inside. Then the tower suddenly divided north and south at the top. The minarets then fell, the north-east one falling on the roof of the church, and driving the rafters against one another, beat down 3 pillars out of 4. This, together with some large stones falling from the south-east angle, unroofed almost all the north and middle aisle beyond the pulpit, as well as one of the pillars in the south aisle, which came down and caused the unroofing of the south aisle. No persons were hurt, although several had been in both the church and belfry a few minutes before, a wedding having taken place that very morning. The Master and scholars had only just left. The schoolroom, which adjoins the church, was also destroyed. The tower was upwards of 80 feet high, exclusive of the minarets (pinnacles) and 27 ½ feet square. 5 of the bells lay on top of the rubbish, covered with the lead of the roof. The other bell was under the rubbish. The 1st, 3rd and 6th were found to be quite sound; the 2nd and 5th were badly damaged, whilst the 4th had its crown broken off. The destruction was considerable and it is a wonder that nobody was killed. Much of the medieval building was lost, along with at least 4 monumental brasses. One brass was for a John Morton or Sproxton, who was a chaplain to Richard Lewkenor of Brambletye, and therefore associated with Dame Katherine Grey. Katherine Grey’s monument was broken, but the inscription and the figures of her 2 husbands, Grey and Lewkenor, were rescued, along with the wrong central figure. Thomas Wakeham, (1728-1803) a local lawyer, rescued them, and had them reset with his own marble monument underneath. 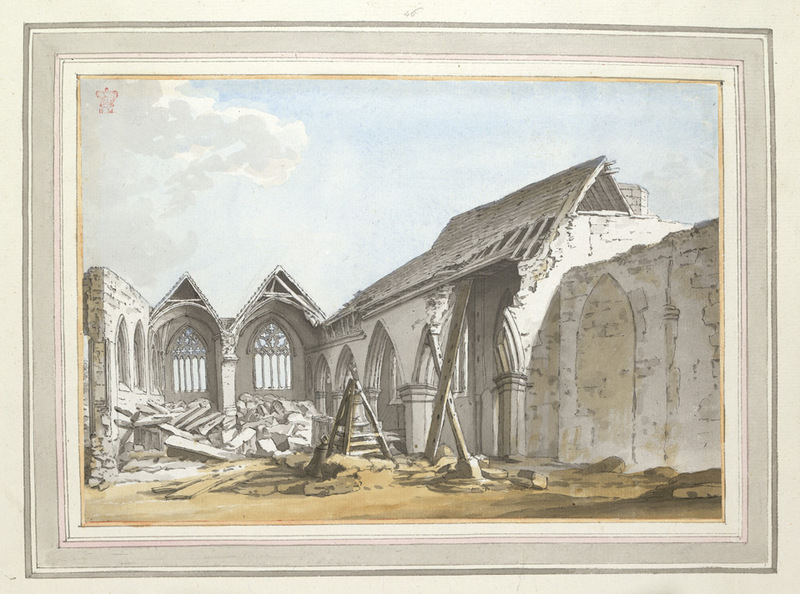 This parish church was demolished by the ruin of the tower on 12 November 1795. 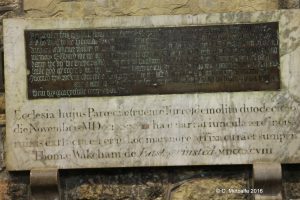 This inscription and these figures were extracted from the ruins and affixed to this monument by Thomas Wakeham of East Grinstead, 1798.